The South Shore of Long Island is among New York State's best areas for saltwater fishing. South Shore fishermen catch striped bass, bluefish, weakfish, croaker, spot, fluke (summer flounder), winter flounder, scup (porgy), tautog (blackfish), sharks, and other species. At the eastern end of Long Island, Montauk Point is home to the New York's largest commercial and recreational fishing fleet. 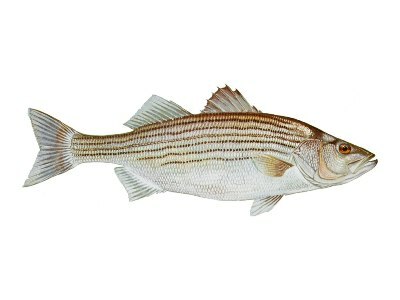 The point is a prime location for surf fishing, especially during striped bass runs. Nearby, converging tides from Long Island Sound, Block Island Sound, and the Atlantic create an area known as "The Race". The Long Island South Shore is protected by Fire Island, Jones Beach Island, Long Beach, Rockaway Beach, and other sections. Between Long Island and its barrier area are a series of coastal bays including Shinnecock Bay, Moriches Bay, Bellport Bay, Great South Bay, South Oyster Bay, Jamaica Bay, and numerous smaller estuaries. The South Shore is broken by Shinnecock Inlet, Moriches Inlet, Fire Island Inlet, Jones Inlet, and East Rockaway. In 2012, Hurricane Sandy breached Fire Island in three locations. Although two breaches were closed, the third breach, located near Bellport, remained open. Soon after the storm, the Breach began to have significant effects on Bellport Bay and Great South Bay. Located along the South Shore are numerous artificial reefs including Sinnecock, Moriches, Fire Island, Kismet, Fisherman, Hempstead, Fishing Line, Atlantic Beach, and Rockaway.